An olive oil soap enriched with shea butter and coconut for the care of dry / very dry skin. 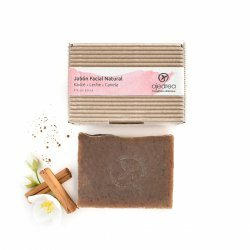 The moisturizing power of shea butter gives new vitality and elasticity to your skin and combines with a soft aroma of natural cinnamon. Almost good enough to eat! Sensitive, irritated skin? 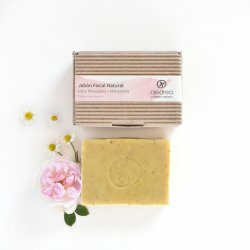 ... try our rosehip facial soap with camomile to soothe and regenerate the skin. 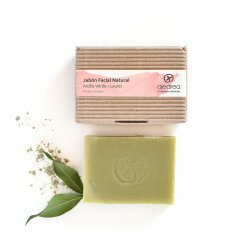 Made with our cold olive and coconut formula, we have added virgin rosehip oil and chamomile flower for their highly soothing and regenerating qualities. Olive oil and coconut soap is recommended for skin suffering from acne. The mask effect of green clay cleans and deeply degreases the skin, preventing the formation of blackheads powered by the essential oil of laurel. In short, a very nice soap begin the day with! 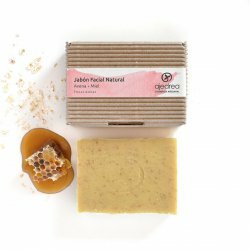 Oatmeal and honey soap with a touch of apple essence .. a tasty and nutritive soap! The milled oat flakes provide gentle exfoliation, removing dead skin, while honey provides a smooth protective coating. Perfect for daily facial care!